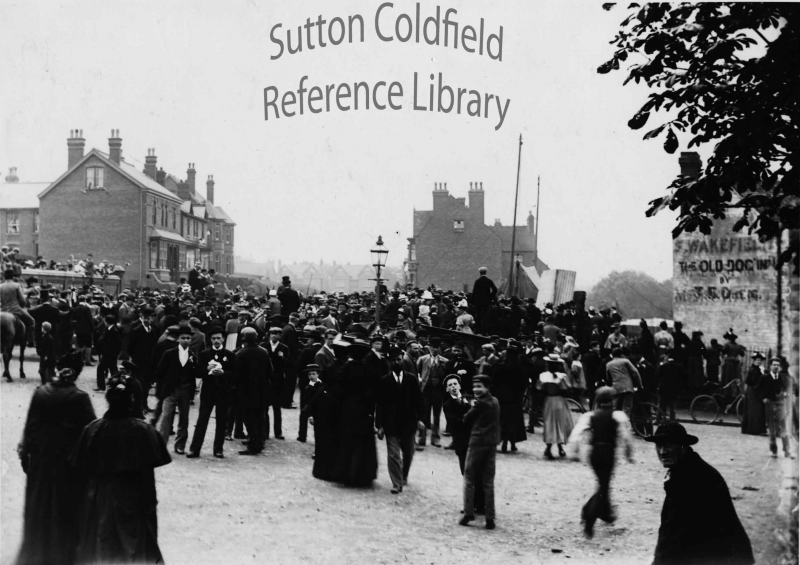 Sutton Coldfield celebrated Queen Victoria’s Diamond Jubilee on Tuesday 22nd June 1897. “All Sutton was early astir” wrote an anonymous visitor “and the proceedings of the day were really commenced at nine o’clock, when the Mayor cut the first slice from the still-roasting ox”. Later, the mayor led a procession from the flag-bedecked town hall in Mill Street to the parish church with brass bands playing, and on the return journey several decorated carriages joined the line, the fire engine bringing up the rear. The weather stayed fine for the afternoon events in Sutton Park, where the maypole-dancing by children from various schools was much admired. Sir Benjamin Stone took over 100 photographs of the maypole dancing, and he later took some of the children with him to show the photos to the Queen. A great firework display completed the celebrations. A remarkable event which took place in 1899 came to be associated in popular memory with the diamond jubilee. This was the remarkable feat of the Erdington baker, H.E.Prosser, of transforming growing wheat into bread in the space of eight hours. The grain was harvested at 10.00 a.m. on August 14th, taken to New Hall Mill to be ground, the flour then was baked at Erdington to produce bread ready to eat at 6.00 p.m. Two loaves were sent to Queen Victoria “to show what could be done in England”. By 1977 New Hall Mill had been restored to working order by Sir Alfred Owen, and it was decided to celebrate Queen Elizabeth’s Silver Jubilee by offering to bake bread made with New Hall Mill flour to present to the Queen as (so it was thought) had been done for Queen Victoria’s Diamond Jubilee. Two dozen loaves were baked for the Queen by master baker Clifford Golby at his bakery in Mere Green Road, together with a roll which is now preserved in the Queen’s Collection along with the 1899 bread. In 2002 the Friends of New Hall Mill marked the Golden Jubilee by baking bread using New Hall Mill flour and taking the loaves to Buckingham Palace. We looked into the history of “the Queen’s bread” and discovered the mistake about the Victorian Diamond Jubilee; the Friends of New Hall Mill are not baking for the Queen this year, but you can have some flour with a royal flavour if you come to the next New Hall Mill open day, Sunday June 10th.